Whynter - ARC-142BX : Portable Air Conditioner Review • The Air Geeks, reviews of air conditioners, dehumidifiers and air purifiers. The ARC-142BX is a high output air conditioner that offers a cooling capacity of 14,000 BTU. This sleek and compact system uses eco-friendly refrigerant and it is energy efficient. In addition, the ARC-142BX offers a dehumidifier mode that allows users to control the amount of moisture in their rooms. This mobile cooling system is suitable for bedrooms, workshops and garages, server rooms, et cetera. If you are planning to buy this air conditioner for your cooling needs, it is important to understand it features, strengths, and weaknesses. If that is the kind of information you are looking for, then we are glad to inform you that you are in the right place. We have researched widely to provide you with accurate information about this air conditioner. We hope that the information will help you to decide whether this is the right air cooling system for your needs or not. Without wasting time, we will start with its features. To start with, the ARC-142BX is a portable and compact air conditioner that is suitable for rooms that are as large as 500 square feet. This strong unit offers an impressive 14,000 BTU cooling capacity. From our research, we have observed that this unit offers best performance when it is used in a space that is smaller than the recommended size. When installed correctly, this unit cools a room within a short time. The ARC-142BX utilizes an advanced self-evaporating technology to cool the room and minimize accumulation of the condensate. The water that it captures is used to cool the air thereby enhancing the overall efficiency. The dehumidification function of this air conditioner regulates the amount of moisture in the air to ensure that it is within the desired levels. This combination of features ensures that your room has a constant supply of cool air that is free from excess moisture. If you live in a high humidity place and you are looking for an air cooling unit, then the ARC-142BX is a suitable solution for your cooling needs. It offers a superior dehumidification capacity of 71 pints per day. Do you live in a place that experiences intermittent power outages? This air conditioner features a memory that stores your settings. You therefore don’t need to reset your unit manually after every power outage. Furthermore, the ARC-142BX features a 24-hour timer that allows the user to program when the unit goes on and off. You therefore don’t need to be in the house for the unit to control the environment of your room. Apart from ensuring that the air in your room is clean and free from excess moisture, this unit features an activated carbon filter and a washable pre-filter. The pre-filter traps airborne particles while the carbon filter removes odors to ensure that the air is clean and fresh. In addition, this energy-efficient unit offers four operational modes: air conditioner, auto, fan, and dehumidifier. It comes with a remote control and offers a 4 speed fan. Not bad! Although this unit offers impressive features, we noted that its hoses and attachments are poorly designed. As a result, it is difficult to assemble the unit properly. The poor design of these fixtures accounts for the leakages that have been reported by users. Unless you are ready to do improvise, this unit may not be the ideal solution for your cooling needs. Relatively quiet. Just like all home appliances that have a fan and a compressor, the ARC-142BX produces a low sound. But we noted that is quieter than most units of same or lower capacity. Highly effective when installed in small rooms. We noted that this unit delivers impressive performance when it is installed in small rooms (200-300 square feet). Low quality hose and attachments. We noted that the hose and attachments are not the best quality. Leaks water. Many cases of the unit leaking water have been reported. This can be attributed to the poor design of the hoses and attachments. Arrived very fast and did the job as described, I use it in a slightly larger room than it gives guidelines for but it works, kept me comfortable during really hot days. 1. Definitely keep ahead of the heat, do not wait until it is 85 out to turn it on, it will take a while to cool down but that is completely expected! 2. The tubing is a bit tricky - that is the one thing that could use some improvement but ultimately this worked fantastic for me and I was so glad to have it as I work from home and the heat was exhausting - best money spent all summer!" Much better than I imagined it would be. We use it in a closet that houses our servers and UPS units. Previously when using a Haier (SP) unit of the same BTU measurements the closet never got below 79 degrees. With this unit the closet stays at 64 degrees all the time. And it is a lot quieter. I would recommend this to anyone wanting a better than average portable AC unit." 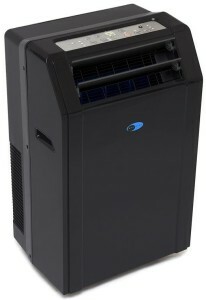 The ARC-142BX is a portable air cooling system that is suitable for small and medium rooms. This unit is also designed to ensure that your room has clean and fresh air. The self-evaporative technology used by this unit enhances its efficiency by utilizing the water absorbed from the air to cool your room. Despite the impressive features offered by this air conditioner, we have observed that its hoses and attachments are poorly designed. This makes it difficult for users to assemble it. Furthermore, the reported cases of water leakages can be attributed to the poor design of these fixtures. Are you ready to do improvisations? If you are ready, then you can proceed and buy this air conditioner. Otherwise, it can be a source of headaches! This air conditioner costs $ 570. Recommended by the Air Geeks!